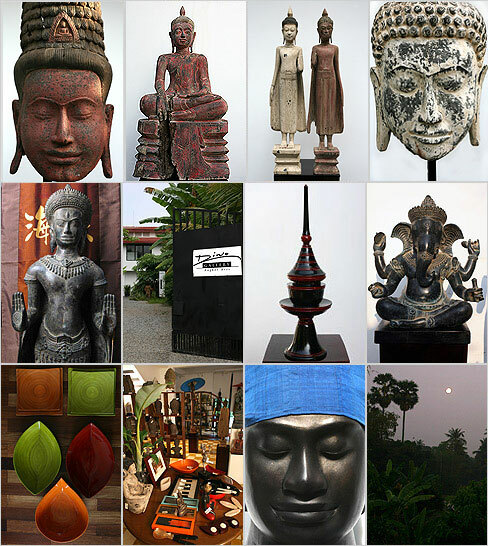 Diwo Gallery 1 features a selection of the most refined Khmer statue and Buddha’s. And displays home decor, books and a permanent exhibition of Thierry Diwo’ s photography. Located at 5 minutes from the center of Siem Reap the gallery has two terraces, and a nice garden. Diwo Gallery 2 the shop, located in the city center river side, next to the old market, between Monument Books and Ta Prohm Hotel.A handy place for shopping. We use to ship worldwide, feel free for asking us a transport quotation.The payments are doing by bank transfert. The Gallery displays lacquer, silver, wood, silk items, ritual object, jewelry. An extensive photo collection on Angkor images of monuments empty of tourists, with children, monks, elder, prayer all print in sepia color.